Borderlinx | Buy Weissman and ship worldwide with Borderlinx. Cheap rates guaranteed. Weissman is the place to go for amazing dancing outfits, for all ages. Having worked with dancing teachers for more than 50 years, Weissman understands the needs for high quality and comfort and sizzling style for performing dance costumes and dancewear. Every season, a team of costume designers creates fresh new collections of up-to-date classics and edgier outfits to please all dance styles and routines. You'll find luxurious sequin, satin and lace silhouettes to wow the crowd and simple and elegant bustier in premium fabrics. A majority of Weissman's outfits are made in America, guaranteeing its top quality, for a reasonable price. You want to order your Weissman Costumes USA shipped right to you? 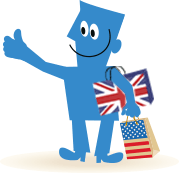 Buy Weissman Costumes in the USA and have your outfit sent to you overseas with Borderlinx! Shipping, tax & duties can be calculated beforehand with our Shipping cost calculator, so you don't run into any surprises. A number of services are available through Borderlinx to make international ordering from Weissman Costumes USA hassle-free, including concierge, free repacking and consolidation services.